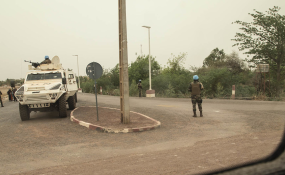 Peacekeepers serving with the UN Multidimensional Integrated Stabilization Mission in Mali secure an intersection in Mopti, Mali (file photo). A proliferation of armed groups fighting government forces and their allies in the centre and northern areas of Mali following a failed coup six years ago, have made MINUSMA the most dangerous mission to serve in as a UN 'blue helmet'. A statement from the Mission said that peacekeepers based in Ber, close to Timbuktu, had "repelled a complex attack, launched simultaneously by several pickups armed with rocket launchers and machine guns", as dawn broke on Saturday. The UN Special Representative and head of MINUSMA, Maamat Saleh Annadif, expressed his indignation over the attacks carried out by "enemies of peace". "I strongly condemn this brutal attack which will not undermine our determination to support Mali, on its march to peace", he said. "The perpetrators of these crimes must be prosecuted and made to pay for their actions", he added. The MINUSMA chief extended his condolences to the families of those killed, and wished the wounded a "speedy and complete recovery".